The Louisiana Department of Education has released the results of the 2017-18 LEAP 2025 assessments for grades 3-12. These assessments measure student performance on Louisiana standards in English language arts (ELA), math, science, and social studies. These results reflect the first year of measuring performance against a minimum expectation of “Mastery,”—more rigorous than the previous expectation of “Basic,” and a better indicator of whether a student is on track for college and career readiness. These assessments have been carefully crafted to align with Louisiana Student Standards, which measure the necessary knowledge each student is expected to master, year after year in order to graduate from high school on time and ready to enter college or the work force. In New Orleans, one-third of schools with grades 3-8 increased performance from last year, but the city as a whole dropped as compared to other districts. 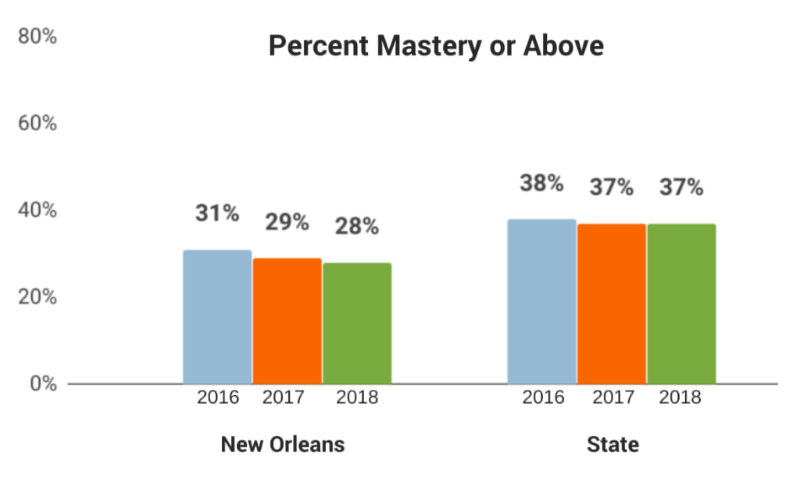 New Orleans student performance in grades 3-8 decreased from 34% to 33% Mastery and above in ELA (-1), and from 25% to 24% Mastery and above in Math (-1). Statewide, the percentage of 3rd-8th grade students scoring Mastery and above in ELA improved from 42% to 43% (+1) and remained the same in math at 32%. New Orleans outperformed the state average for African-American students and English Language Learners in grades 3-8. 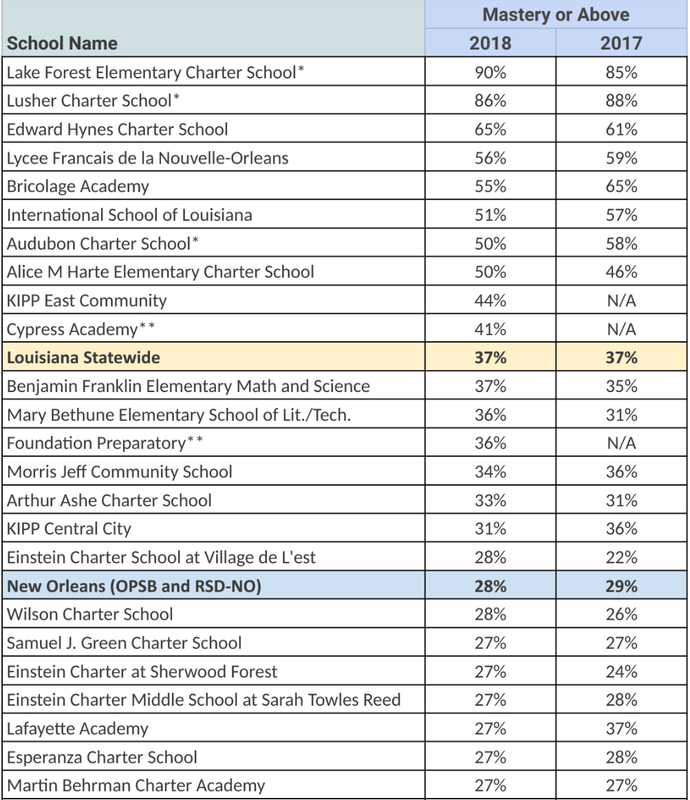 New Orleans’ district rank fell from 50 to 52 out of 70 districts across the state, based on 3rd-8th grade Mastery and above performance in ELA and math combined. This is the first year high school students took LEAP 2025 test, which replaced EOCs in English I and II, Algebra I, and Geometry. 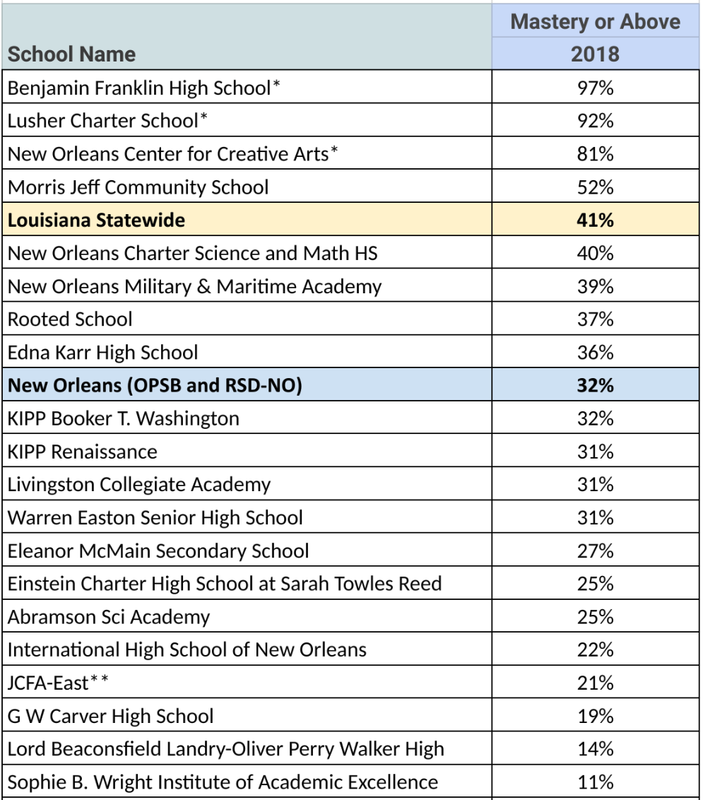 In this first year, New Orleans high school student performance was 4 percentage points higher than that of elementary and middle school students, with 32% of students scoring Mastery and above in ELA and math combined. Note: All combined ELA and math performance scores were calculated using estimates based on suppressed data in LDOE publicly released files. In New Orleans, two out of four groups of historically disadvantaged students outperformed state averages in grades 3-8 ELA, math, and social studies. 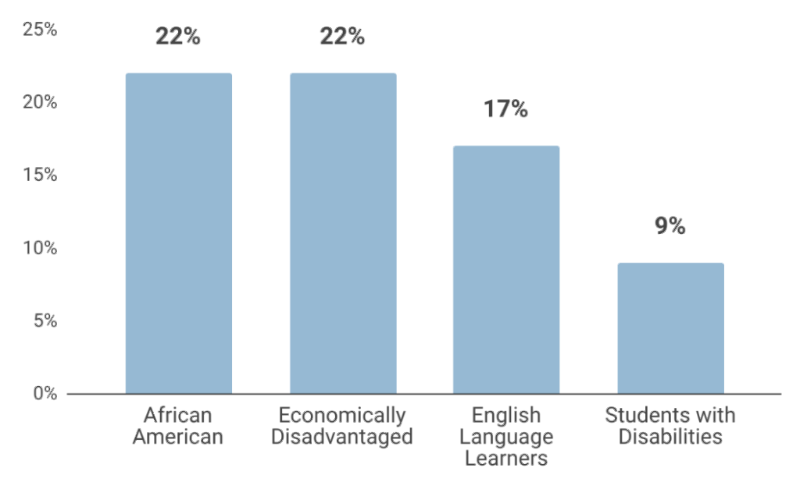 African-American students and English Language Learners outperformed the state average for their subgroups by 1 and 2 percentage points, respectively. Between 2017 and 2018, New Orleans English Language Learner (ELL) performance in grades 3-8 improved by 2 percentage points. *For ELL student performance, New Orleans’ ranking of 16th is tied with 5 other districts that also scored 17% Mastery and above. 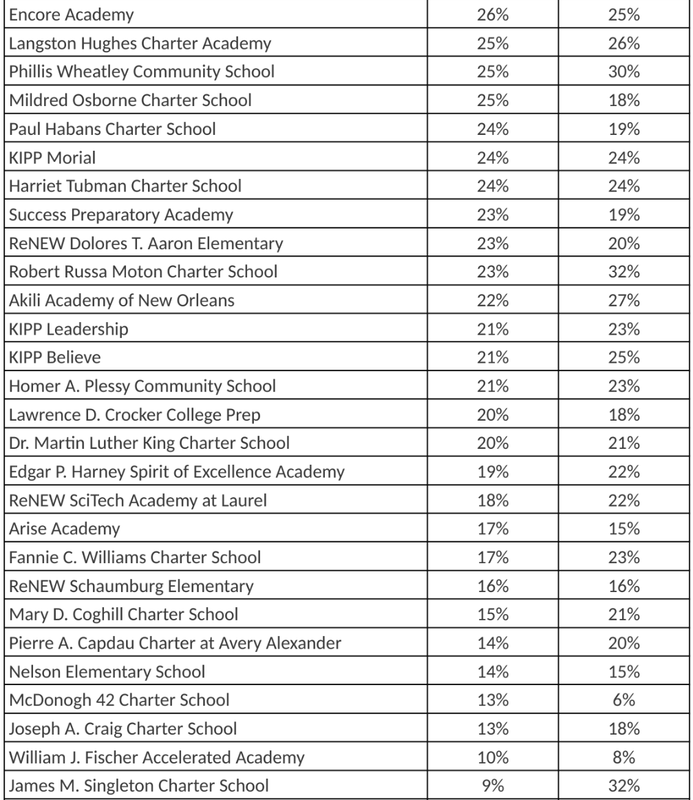 For African-American student performance, New Orleans’ ranking of 24th is tied with 4 other districts that also scored 22% Mastery and above. The chart below shows school performance on the LEAP assessments for ELA and math over the past two years. This is the second year students in grades 3-8 were evaluated for performance on the LEAP social studies test and required to take all assessments online. In addition, students took a field test in the new science assessment for grades 3-8. Congratulations to the following six schools that demonstrated high growth last school year! These schools gained 5 or more points in the percentage of students scoring Mastery and above in ELA and math combined. The chart below shows LEAP 2025 data for high school grades in ELA and Math combined. 2017-18 is the first school year with assessment results for LEAP 2025 for high school. Having a complete set of LEAP 2025 data for all tested grades (3-12) will allow us in future years to evaluate progress across all grade levels from year to year. We are proud of the work our educators and families do every day to support students to meet these rising standards. The results this year demonstrate that more work is needed to ensure our students succeed. We know they are up to the challenge. High-quality, rigorous curriculum has the biggest impact on student learning, and at NSNO, our Instructional Quality Initiative (IQI) provides funding and support to schools to transition to these new, high-quality standards and aligned curriculum. This year, 84% of New Orleans open-enrollment schools are participating in the IQI by purchasing Tier I curriculum and partnering with expert organizations to support implementation of this curriculum. As part of this initiative, right now 140 New Orleans educators representing 47 schools are at Standards Institute—a national week-long training focused on developing a deep understanding and expertise in standards—preparing to increase instructional rigor in their classrooms this year. We’re confident that schools that make the transition to successfully implement high-quality curriculum as part of the IQI will see gains in student progress in future years. New Orleans children are smart, talented, and destined for greatness. It’s on us to make sure they get the instruction and support they need to achieve the successful life outcomes they deserve. For more information, please review the Louisiana Department of Education’s press release, which includes links to detailed score reports by school for all grades and subjects.